Home » The Snowflakes Stayed! Yesterday, I wrote that snowflakes that stay on my nose and eyelashes were among my favorite things. Well, those snowflakes sure stayed. With 5-7″ of snow on the ground here is southwest Wake County and nearby Chapel Hill and even higher amounts Durham, I have added “gleeful squeals of schoolkids on a snowday” to my list of favorites. Since school has been cancelled toay and is questionable for tomorrow, most kids are nearly euphoric. By Friday, some parents might want to add “bring kids to the bus stop” to a list of faves, but few can object to the enchanting atmosphere they woke up to today. Mother Nature’s warmth will help melt the snow over the weekend, with temperatures in the 50’s, allowing folks to once again enjoy the Greenways, parks and sidewalk window shopping on Salem Street. 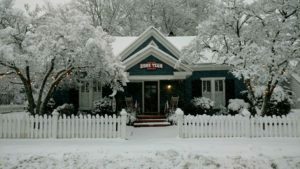 For now, Mike, Tonya, Sue and Joy from Triangle Home Team Realty hope you enjoy this glorious winter wonderland. Be safe.